Philadelphia Eagles offensive lineman Lane Johnson found himself in the unenviable position of having most of his causes of action against the NFLPA dismissed in a lawsuit that has been waged for over two years. Despite some disturbing pleadings regarding union misconduct and retaliation, Southern District of New York (SDNY) Judge Richard Sullivan denied Johnson’s motion for discovery and ordered him to respond to the NFLPA’s motion for summary judgment, which could put an end to his case. Johnson presented a compelling case against the NFLPA. He claimed retaliation and collusion on their part with the NFL, because he exercised his freedom of speech, and spoke critically of the union. He crafted a well pled complaint that alleged the players association sabotaged his arbitration in retaliation of his criticism, and through his search for the truth and efforts to defend himself exposed several backdoor agreements with the NFL. 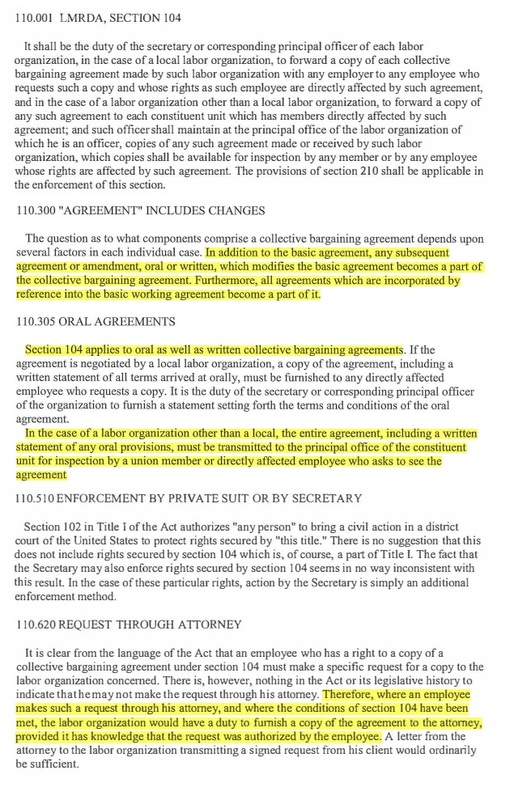 According to Johnson, this is why the NFLPA refused to provide him with a complete copy of his collective bargaining agreement, including modifications in violation of the Labor Management and Reporting and Disclosure Act (LMRDA). 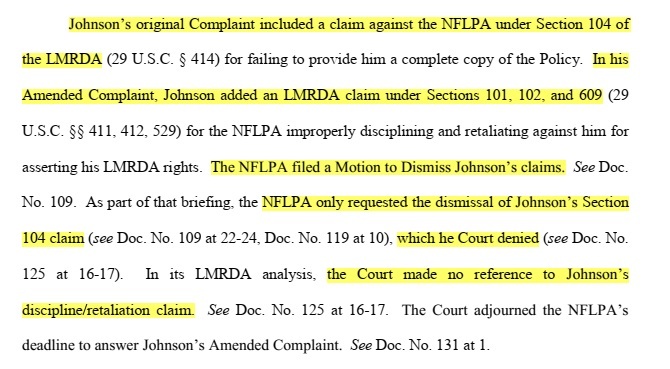 Having dismissed all of Johnson’s claims except for the LMRDA violation, Judge Sullivan rejected Johnson’s bid for discovery and ordered Johnson to respond, to the NFLPA’s motion for summary judgment. Considering the facts of the case are greatly disputed it almost seems as if the judge merely wants to get the technicalities out of the way in order to clear the case from his docket. In my analysis of Judge Sullivan’s order, I stated that unless Johnson’s attorney Stephen Zashin, could find a way to pull a rabbit out of the hat and accomplish the miraculous, I didn’t see the case proceeding any further. I’ll gladly eat those words, because the fiery briefs he filed on January 16 paint a vivid picture of misconduct that now places Judge Sullivan in a very awkward position should he grant the NFLPA’s motion. Zashin didn’t waste any time getting to the point. Those who’ve followed this blog for any length of time know that I’m fond of the devilish details often found in footnotes. Zashin gave the devil his due in short order, footnoting the TITLE of the brief with a rather terse case summary. 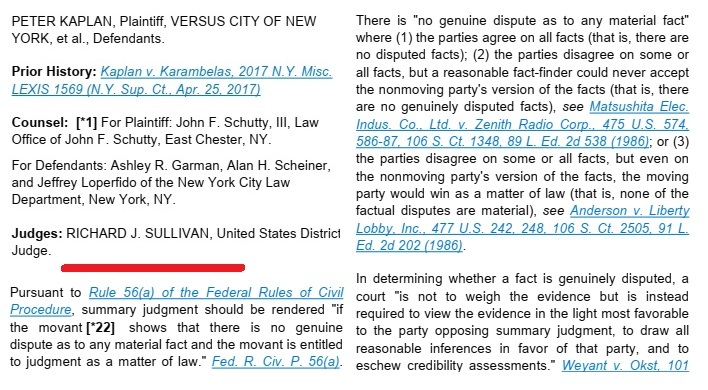 His thirty-page memorandum of law was accompanied by multiple exhibits and a ten-page Counter Local Rule 56.1 Statement of Material Facts in compliance with SDNY local rules. Zashin is quick to point out that by its own admission the National Football League Players Association broke the law. The section above, while it exudes a large dose of legalese, is extremely important because it demonstrates that several of Johnson’s claims have been overlooked or ignored. How this occurred is addressed in detail throughout the brief and attached exhibits. One of those exhibits is the Department of Labor OLMS Interpretive Manual. It contains a Bill of Rights for members of Labor Organizations. Johnson’s rights regarding the documents owed to him are very clearly defined. To paraphrase, Johnson has a legal right to his entire CBA. In addition to the basic agreement, any subsequent agreement or amendment, oral or written which modifies the basic agreement becomes a part of it. Oral agreements must be provided to the member through a written statement. They must also be provided to his attorney upon request, and he, or his representative is authorized to bring a civil action to protect and enforce these rights. His LMRDA rights are not limited to documents, however. Johnson has also asserted his rights under §101 and §609 which to entitle him to “express any views, arguments, or opinions” without the threat of discipline or retaliation. 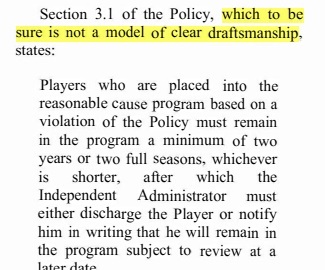 As Zashin explains, “Much of the Policy, including its alleged amendments, modifications, and oral agreements, remains a mystery.” The NFLPA claims to have provided everything required under LMRDA §104, but as pointed out in the brief, the facts are disputed, and discovery is necessary in order to determine the what they are. “Only through this litigation has Johnson received some alleged modifications to the Policy,” Zashin writes, adding, “However, these alleged modifications created more unanswered questions.” In perhaps the strongest statement of the entire brief, Zashin bluntly informs the court—they’re spinning two conflicting tales, both of which cannot be true. He lists the specific areas that are disputed, beginning with provision of the agreement on the Chief Forensic Toxicologist (CFT), for the year prior to and following the applicable agreement to Johnson but oddly not the one in between. 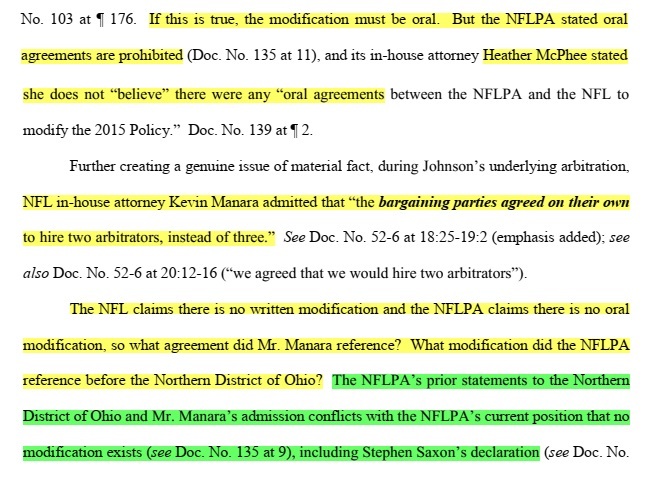 The NFLPA now says “there is no other agreement on this subject to produce.” Then, realizing they were caught in their own lie, Zashin informs that they now reference a December 1, 2016 letter which they provided to Johnson on October 25, 2017—more than a year after Johnson’s arbitration in which a third arbitrator was appointed. To complicate matters even more, however, the NFL and NFLPA are telling different versions of the story. Look closely. The NFL says there is no written modification, and the NFLPA says there is no oral modification. Has anyone figured out who’s on first? There’s an agreement. “It’s not written,” says the NFL. “It’s not oral,” says the NFLPA. What a tangled web. Discovery is needed to learn the facts. Some have said this is a small infraction and the number of arbitrators is a minor issue. Modifications to a contract that affects the rights of a union member, however, is not minor in any way. If they would take liberties with the number of arbitrators, they would likely take liberties elsewhere, and it’s hard to say without any written records, and denial of oral ones, how much has been compromised. We’ve seen other inconsistencies in Johnson’s case. What about Eric Reid? As an analogy, embezzlers typically don’t empty a victim’s portfolio in one fell-swoop but rather incrementally, bit by bit until there is little left of the victim’s investment. In Judge Sullivan’s written opinion dismissing most of Johnson’s claims, he posits that the behavior isn’t arbitrary because it affects the entire union membership and not just Johnson. Here are a couple examples. Since the judge seems fully aware that all members are being impacted by the union’s side deals, he should welcome discovery in order to get to the bottom of the situation and correct the errors. To do otherwise seems a breach of his own fiduciary duty as an officer of the court. 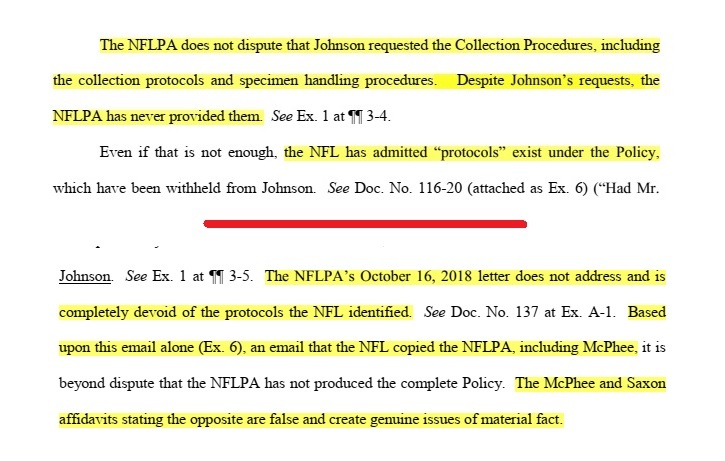 The NFLPA hasn’t provided Johnson a copy of the specimen collection procedures, either, despite, as Zashin points out, these must be reviewed and documented annually. The NFL has admitted those policies and procedures exist, and the NFLPA admits withholding them. All documents referenced are publicly available. The email is one of the exhibits attached to the memorandum of law response to the NFLPA’s summary judgment motion. The McPhee and Saxon affidavits were part of the NFLPA’s defense. Compliance with, or at least for Johnson, being able to examine the protocols was central to making an informed decision as to how, and even whether to appeal his discipline. He wasn’t given this opportunity, but instead, he feels, as any reasonable person could, that he was deceived during the time leading up to his arbitration and then blindsided during its course. In his declaration, Johnson relates how he was completely misled and left defenseless when his union pulled the proverbial rug out from under him. More “who’s on first?” No one seems to want to take responsibility for the reasonable cause testing period. The buck is continually passed without any party producing proof of their statements. 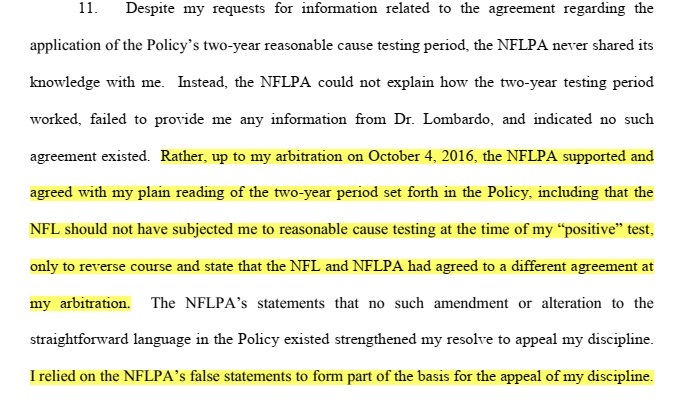 Dr. Lombardo testified under oath that he presented to the NFLPA and NFL “what [he] was going to do” Dr. Lombardo is not a party to the CBA and should not be amending it unilaterally. 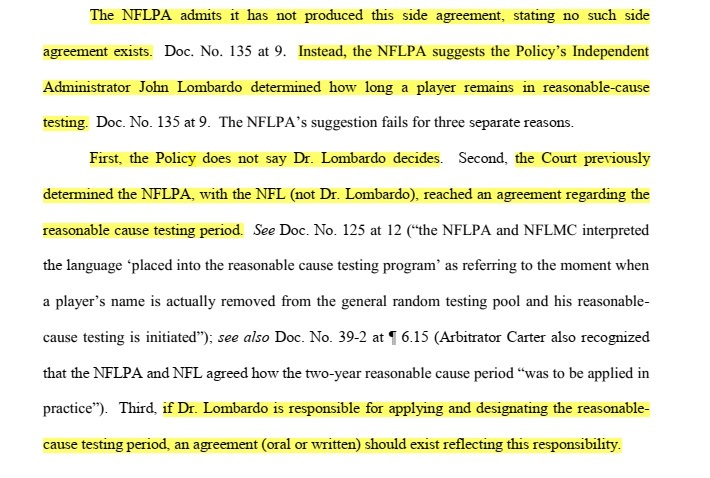 If he was granted mutual consent of the NFL and NFLPA, as required in the CBA, shouldn’t there be a record of when this authority was bestowed upon Dr. Lombardo? Why was something so basic withheld from Johnson? Since these deviations and modifications have indisputably occurred, there is room to wonder if other modifications not yet surfaced have taken place. Unfortunately, it seems to be a drastic remedy courts are all to willing to employ in order to keep their dockets moving quickly. As University of Connecticut Law Professor Alexandra Lahav notes in her book, In Praise of Litigation, that summary judgment has replaced trials in many instances. “This phenomenon,” she writes, “while producing reasoned arguments and decisions in some cases, can in other cases obscure important factual disputes, divert decisions from juries to judges, hide the workings of the justice system that are revealed at trial, and prevent the elaboration of narratives that are important for public debate.” (emphasis mine) This assuredly describes what is taking place here. 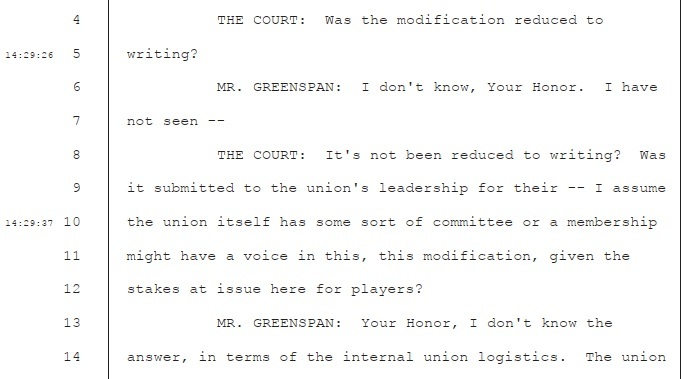 Should Judge Sullivan grant the NFLPA’s motion for summary judgment, Johnson’s factual disputes which seem meritorious in the evidence he’s presented, not to mention a long history of union controversies that have never been fully developed, but shielded instead. This is information that is not only important to Johnson, but his fellow player-union members as well as union members at large. An unfavorable outcome for Johnson further opens a door for similar outcomes for others who allege union retaliation, withholding of documents, or other misdeeds. In this respect, Johnson’s case is of utmost importance. Since Johnson is a professional football player with a greater income than the average American, he can afford to hire a top-notch attorney to represent him. Other union workers in various occupations from teacher, to writer, to truck driver, and everything in between may not be able afford an attorney, much less a highly skilled one, and sustain two or more years of litigation to right the wrong they feel they’ve suffered. Another disturbing factor is that Johnson has acquired excellent representation in Stephen Zashin and the other attorneys at Zashin and Rich. Even in making sound legal arguments, and presenting the most compelling evidence possible without the benefit of discovery, it’s unclear how this will end. The judge’s personal judicial philosophy may also come into play. Judge Sullivan is a Bush appointee who was recently appointed for promotion to the Second Circuit Court of Appeals by President Trump. This is a likely indicator that he embraces a pro-management philosophy, and in what he feels are gray areas, gives businesses more benefit of the doubt than an individual worker. She points to numerous examples and quotes that are hard to debate. She looks to neuroscience that seeks to explain how we think and examines numerous frameworks and theories on judicial choice. Pragmatism may be a factor in how Judge Sullivan has weighed the evidence in Lane Johnson’s case. He has, throughout his opinion seemingly acknowledged the correctness of Johnson’s allegations, while simultaneously devaluing them because he doesn’t view them as having an impact on the single “injury” he’s focused on—that of Johnson’s suspension being upheld or reversed. In his view, the zero-tolerance policy of NFL drug suspensions was the dominant factor, therefore the misconduct that has been strongly presented has been irrelevant to the discipline outcome. Zashin points out that the court acknowledged harm from the withheld documents. 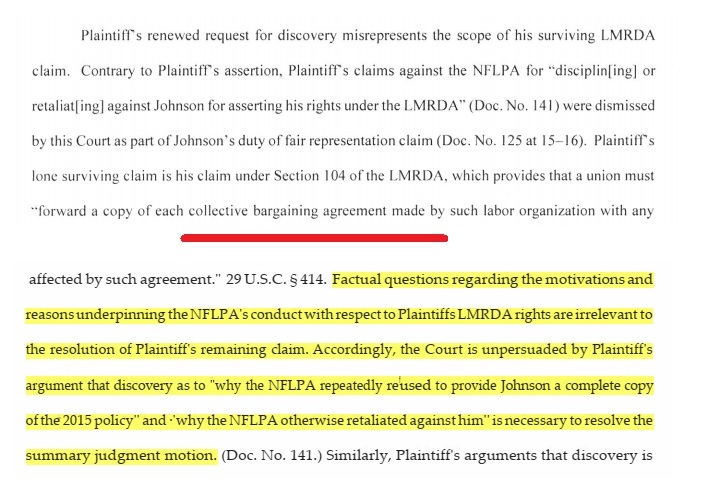 Aside and apart from the lost income/games resulting from the arbitral award, “Johnson has expended time, money, and resources seeking to enforce his LMRDA rights.” In addition to this, Johnson has also experienced injury to his reputation as a result of the NFLPA’s alleged false public statements and likely considerable emotional distress. Often, where financial loss is minimal, courts tend to minimize other less tangible injuries allowing harmful behavior to go unpunished and undeterred. This should be reevaluated. The one thing the court couldn’t dismiss because it was based solely on law was the LMRDA claim. It was indisputable that documents had been withheld from Johnson, for an absurd two years. Yet based on his order dated January 9, Judge Sullivan seemed unconcerned as to the reason the documents had been withheld. Fortunately, as noted above, Zashin pointed out that Johnson’s LMRDA retaliation claim is separate and should be evaluated differently from the duty of fair representation claim that Judge Sullivan dismissed. 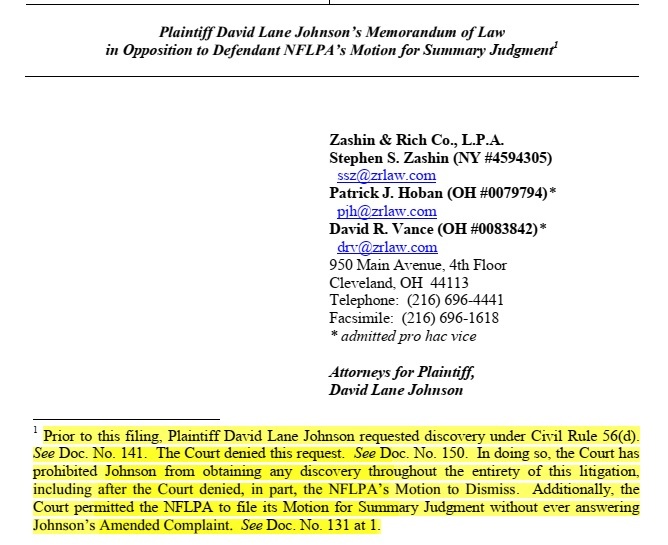 Zashin cites case law to support that, “Under the LMRDA, the retaliation need not be significant and includes such minimal actions as ordering the surveillance of a member or taking action that could threaten the freedom of members to speak out As contemplated by these cases, the NFLPA’s public statements adverse to Johnson, refusal to assist him with his appeal, and continued refusal to provide him a copy of the Policy all constitute retaliation and create genuine issues of material fact. 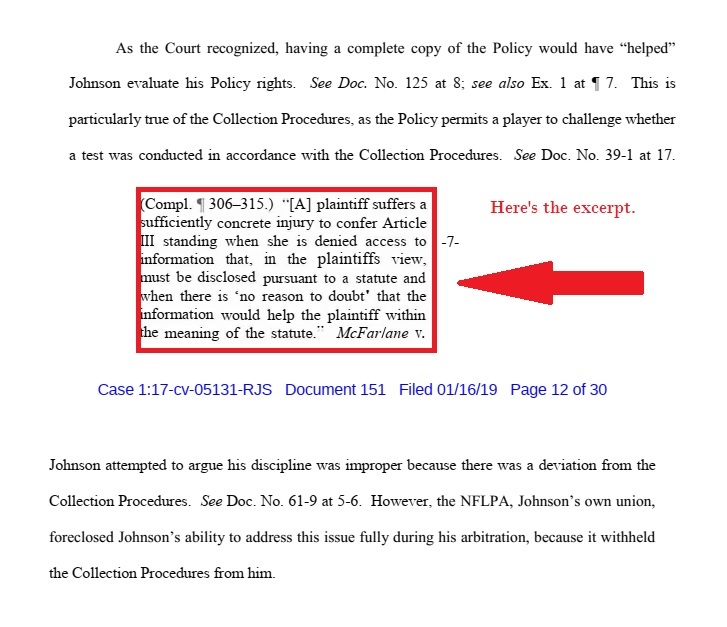 The existence of the claim that apparently both the Judge and NFLPA wish to ignore is clearly in Johnson’s amended complaint, as demonstrated earlier. As much a they may wish to do so, a defendant can’t rewrite a plaintiff’s complaint. They can’t add causes that could have been pled but weren’t or delete the ones they don’t wish to address. In a bold move, but appropriate move, Zashin says, “checkmate” to the judge in citing one of his own opinions to support his claims and reject the NFLPA’s summary judgment bid, with a copy of the opinion attached as an exhibit. “Only when a reasonable factfinder could never accept the nonmoving party’s version of the facts is there no genuine dispute,” Sullivan wrote in Kaplan. Discovery is increasingly difficult to obtain in modern courts but is appropriate when there are genuine issues of material fact to be determined. “Information obtained from litigation provides one of the clearest benefits of transparency for individuals: learning what happened to them and why. In fact, sometimes people bring lawsuits primarily for this reason,” says Professor Lahav. This is likely true for Johnson. Retired Chicago Blackhawk Daniel Carcillo has publicly stated numerous times that he plans to reject the proposed NHL settlement and pursue his own day in court. He emphasizes that for him, it’s not about money—any award he might receive would be donated to charity—he merely wants his league to acknowledge and admit the harms players have experienced and do better with present and future players. Johnson probably wants the same—an acknowledgement of harm, and reforms to keep other players from finding themselves in his position. I hope the courts will allow them to achieve this noble end. Lahav, Alexandra, “In Praise of Litigation,” Oxford University Press, 2017, Kindle Edition, pp. 143-144. Bradley, Anna Spain, University of California Irvine Law Review, Vol. 9:1, “The Disruptive Neuroscience of Judicial Choice,” p.1. 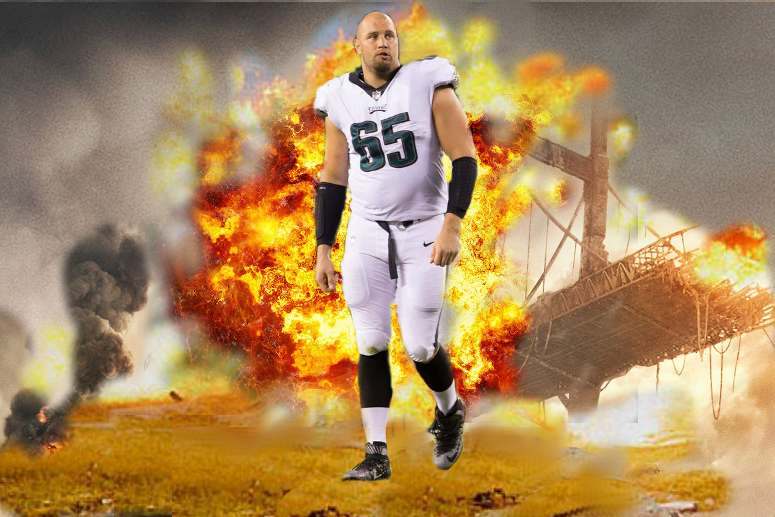 Combined PDF’s of Lane Johnson’s Opposition to Summary Judgment, Personal Declaration, and Statement of Material Facts.